Researchers off the Massachusetts coast captured video of a great white shark breaching and snapping its jaws at a scientist's feet. 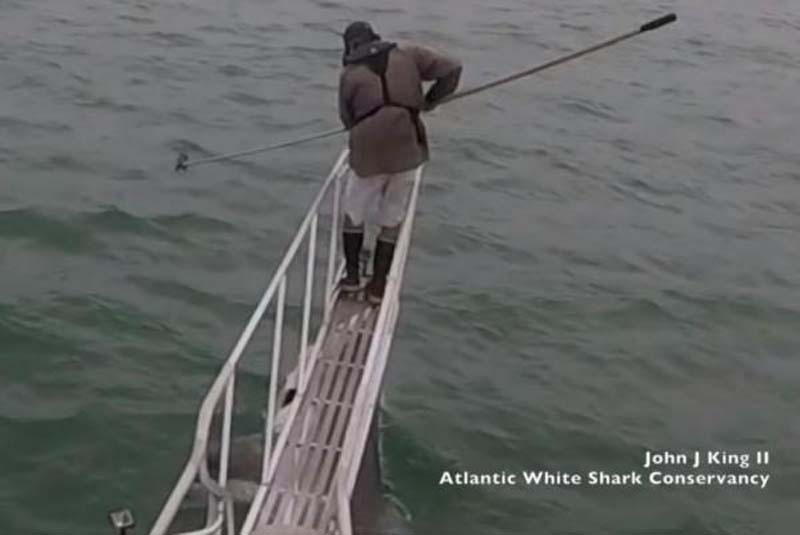 The video, shared by the Atlantic White Shark Conservancy, shows Greg Skomal, a senior fisheries scientist for the Massachusetts Department of Fish and Game and head of the Massachusetts Shark Research program, standing on a pulpit over the water at the front of a research boat. The footage shows a great white shark breach directly under Skomal and snap its jaws at his feet. "Did you see that? Did you see that? It came right up and opened its mouth right at my feet," Skomal says in the video. "While encounters like this one are rare, this video shows that they're certainly possible," the Atlantic Shark Conservancy said. "White sharks are wild and unpredictable animals. This is a good reminder of the importance of not becoming complacent and always staying vigilant when in or on the water."